Help CentreUsing SuperControl Managing enquiriesHow do I set-up how my property photos display on a quote? If you have been asked to provide a quote to a potential new guest, it’s now possible for SuperControl’s PLUS and AGENCY customers to add more than one picture to that quote. 1. Go to Properties > Edit> select property > Photos > Go. 2. Click Upload photos to add any additional photos of your property. 3. Choose how many photos you wish to display in your quote by going to Admin > General details. 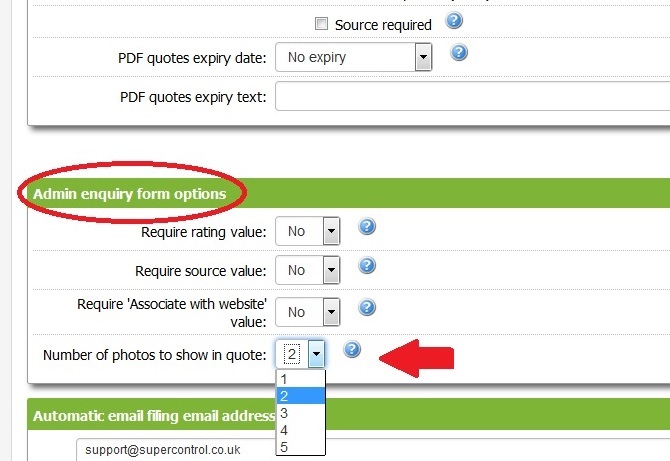 Then, scroll down to Admin enquiry form options. 4. You can then select how many pictures you wish to show (up to a maximum of five). 5. The quote will display the number of images you select, providing potential guests with a better picture of the property that they are interested in. Prev: How do I generate and send a quote by email? Next: Can I have an enquiry form on my website? It would be good to add how we can add the text that goes with a picture. This text pulls from your short description field. Go to Properties > Edit > select property > Web details > Go. In here you will see a text field called "Short description". Enter your property text here and click Save. It will then auto-populate like it does in the image above. Repeat this process for all properties.